Amanda Visell and COARSE is set to release the final edition of “ZigZag” Chop Chop! We own the alternative colourway ourselves and shockingly great as well as a good value too (check out our LIVE unboxing below) For all you collectors heading to DesignerCon this weekend will have the chance to own ZigZag – Chop Chop Final Edition. The final edition of ZigZag has emerged from the forest. 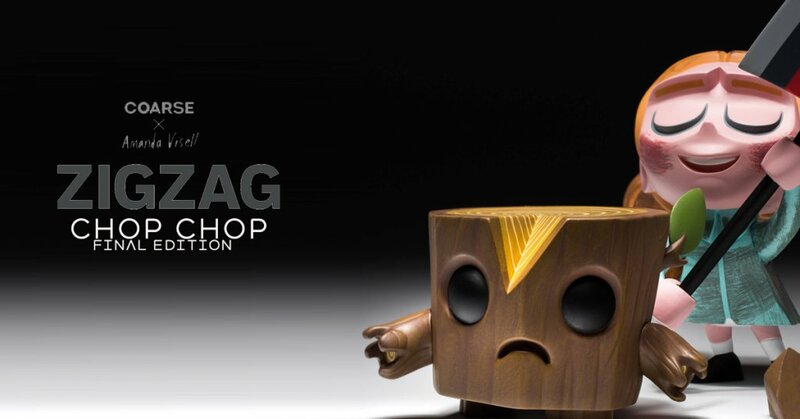 ZigZag – Chop Chop, designed by Amanda Visell and brought to life by coarse, will be available exclusively at the coarse booth at DesignerCon. Each edition is 4.5’’ [approx. 11.5 cm] tall and contains one frightened stump, one proud child, a removabale axe, one chunk of wood ZigZag has already lost, and a stand for the child’s feet. Amanda will be signing ZigZags and other coarse x Amanda Visell releases on Sunday at 11 am. COARSE will be at booth #612 at DesignerCon all weekend long with some back room finds and emergency stock as well as a few new sculptures for sale and on display.